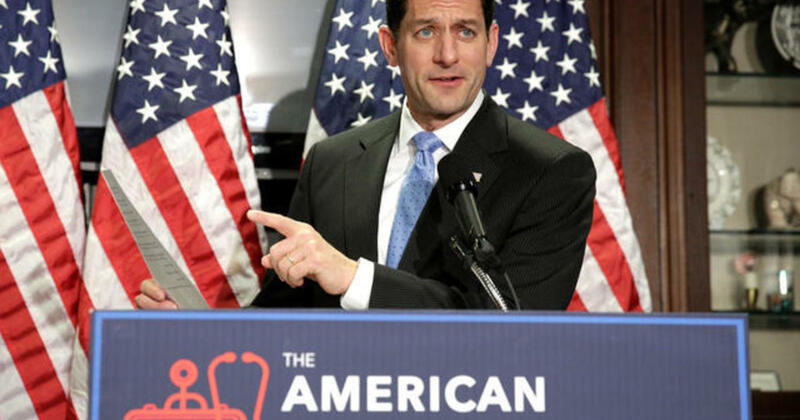 The debate over the American Health Care Act (AHCA), the House Republicans’ attempt to replace Obamacare, has been revealing beyond all expectations. For many people, nothing is more important about this bill than the number of people it helps to buy health insurance. For the Republican leadership, however, it seems the most important value of the bill can be summed up in one word: money. Time and again the leadership talks about the bill as if its most salient feature is the amount by which it can cut taxes or reduce the federal budget deficit. Exhibit A in this display was a tweet from Speaker Paul Ryan’s official account. The tweet was in response to a Congressional Budget Office score of the bill that said over 14 million people currently insured through Obamacare would lose their coverage under the AHCA. Ryan could have tried to combat this claim. He could have made the traditional conservative argument that a federal subsidy of health insurance for working and middle class Americans, the main beneficiaries of expanded Obamacare insurance subsidies, was not the proper role of the federal government. Instead, he fell back on the tired old GOP refrain: it will save us money. His tweet made three positive claims for the AHCA: it would lower premiums by 10 percent; it would cut the federal deficit by more than $330 billion; and it would cut taxes by over $880 billion. Since offering these claims, he has backed them up with an amendment that cuts taxes even more while not increasing the amount of subsidies older Americans who get their insurance through the exchange would receive. This disconnect with the values of ordinary Americans, and especially those of the voters who elected Donald Trump president, could not have been made more glaring. Despite its control of the Congress, the presidency, and the vast majority of statehouses, the GOP remains what it has been since the Great Depression—America’s minority party. Democrats have outnumbered Republicans in opinion polls in every year but one since 1932, and they outnumbered Republicans again even in the 2016 exit poll. And that’s not simply a case of California and New York ganging up on “the real America.” Democrats outnumbered Republicans in Wisconsin, Michigan, and Pennsylvania—three of the states that pushed Trump into the Oval Office—according to 2016 exit polls. Trump owes his presidency, and Republicans owe their continued control of the Senate, to the votes of Democrats who were willing to give a Trump-led GOP a chance. It’s not hard to figure out why Democrats have out-polled Republicans for that length of time. For years the polls have also shown that the GOP is viewed as the “party of the rich” and the Democrats as the party that will give the working person a hand up. But in 2016 the roles were reversed. It was Hillary Clinton who was pilloried as the servant of the wealthy, first by Bernie Sanders and then by the GOP. It was Donald Trump who told working-class Democrats in the Midwest they deserved an active government that stopped unfair economic competition from foreigners (through immigration and through trade) and that he would not touch their hard-earned Social Security and Medicare. Trump took the traditional GOP priority of saving money off the table, and with that removed the traditional Democratic advantage with the voters most strategically placed to select a President. The GOP’s focus on tax cuts and money threatens to turn the tables back in the Democrats’ favor. Obamacare’s Medicaid expansion was targeted like a laser on the working class voter. Midwestern Republican governors could see this: every one either expanded Medicaid (including Vice President Pence as Indiana governor) or reformed Medicaid so that the other element of Obamacare—the federal exchange—would increase insurance coverage. But the way the AHCA saves money is by reducing the subsidies that would flow to the newly insured, either by reducing their exchange subsidies or by capping the growth of Medicaid expenditures. Democrats who crossed over, perhaps for the first time in their lives, to vote for Trump may have wanted many things, but losing their health insurance to save a few bucks surely wasn’t one of them. And those voters won’t even be the ones who save the dough. The taxes that are being repealed disproportionately affect the already well-to-do, especially the 3.8 percent capital gains tax and the additional 0.9 percent Medicare tax on ordinary income that applies once a person earns more than $200,000. Democrats often like to charge that Republicans cut programs that benefit the average person to finance tax cuts for the rich: the AHCA lets them do that with impunity. Republican politicians need to understand that most non-Republicans do not value the freedom a wealthy person gains from lower taxes more than the spending that directly makes their lives more comfortable and more secure. There’s plenty of government spending that doesn’t fit into that category, and President Trump’s budget placed a lot of that on the chopping block. But for most voters, money isn’t fungible and saving it certainly isn’t one of the Ten Commandments. A dollar spent on foreign aid programs is much less valuable to them than a dollar that helps them afford the good they most desire, a healthy life. Donald Trump instinctively gets that. Conservatives mocked him in the primary for spending most of his life as a Democrat or an independent, but I think his core supporters found that a plus. When he says that companies shouldn’t make a buck by shipping American jobs overseas, his voters hear someone who values their lives over his friends’ money. He shouldn’t forget that this belief, the perception that he cares about people like them, was his greatest asset in his race for the presidency. The president should spend the dividends from that investment on this early test and make sure that the Obamacare replacement bill that finally passes values a person’s life more than it values a billionaire’s dollar.